Weave the information in between puke breaks. Gotta say, I have Realllllllly bad feelings about this. Reallllllly bad feelings, Dave. 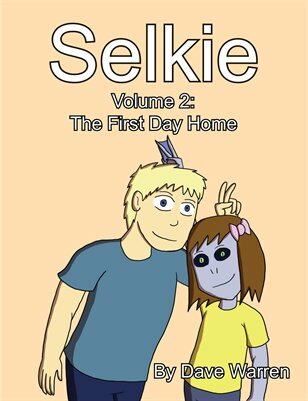 On one hand – most characters so far have taken the information well, and it would be strange if the hipster artist type ends up freaking out about it, but this strip https://selkiecomic.com/comic/selkie1032/ feels like foreshadowing. I disagree… first he never said how much he is going to tell. I am guessing it may only be that she doesn’t have a condition but is part of a different species. I see this as Andi has really stepped up on this co-parent thing. She could just focus on Amanda if she was being selfish. But she knows that she wants to be friends with Todd (at least) and Amanda needs her father too, and Selkie IS Todd’s daughter. She needs to respect that and support that and has been. Selkie’s heritage is something she she should probably be aware of if she is going to help support this in the future. Especially since if it came out at a bad time instead of now at a time of Todd’s choosing, it could lead to feelings of confusion and betrayal when support is needed. Isn’t that information kind of classified? Yeah, but we’ve seen how good Andi is at keeping secrets. The secret about Amanda, for instance. Not meaning this to be biting, just saying she legitimately is good at keeping information to herself. When does Selkie get a birthday party? Does anyone even know for sure when her birthday is? I think the day she appeared at the orphanage can be substituted? Like, that’s the day she legally came into existence, so it counts. Alternatively, she may actually know her own birthday. She wasn’t a newborn when she was left there, after all. I guess that assumes Sarnothi celebrate their birthdays. Culturally, even humans can vary in how they celebrate it or count it. would Sarnothi celebrate their laying-day, or their hatching-day? Do you celebrate conception-day or delivery-day? I feel a pitch to Hallmark coming on! Dondonesque: (snort, giggle). That was very good. Well done! Sai Fen already clarified that hatching-day is what’s significant. Selkie’s birthday is in late May. The 24th, I believe. It is listed on her naturalization papers. May 24th is also, by a strange co-inky-dink, the day the first strip was up. You thought it was coincidence, but it was I: meta-reference! Non-JoJo-meme answer: Alpo is correct on both counts. Selkie’s canon birthday is May 24th (for reference, it’s mid-to-late February in the comic’s current timeline.) 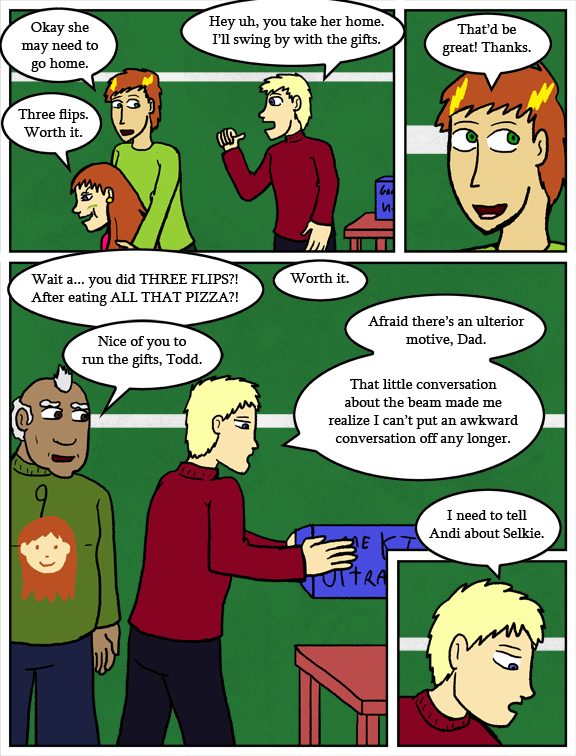 which is itself also a meta reference to the date the first Selkie strip went online. She shares a birthday with me! Your first strip also went online on a May 24th? Andi might be cool with a lot of things but she might not be ready for this. At least not yet. …it would be so easy to dismiss the Big Honking Laser Beam as almost anything. Laser light show testing. Fireworks. A searchlight. Come on, guys, it’s the same way you discredit a UFO, and nobody really believes in those. UFOs traditionally don’t make reputable news networks and get seen by literally thousands to hundreds of thousands of people apiece. While it would be easy to discredit in -really- dry areas as crazy people near the lakes, nearer to the lakes where the GIANT HONKING LASER BEAM OF GREEN LIGHT THAT FILLED THE SKY was seen, it would be rather hard to tell people that it was anything, because every single person is going to be convinced it was a weapon. Hell, I’ve met people who have believed that the fireworks their neighbor fired off were actual rockets. Paranoia is a very real, very present, thing. Mr. Brown is not going to be pleased, methinks.